One of the earliest proofs that singing, accompanied by musical instruments existed during Buddhist era (500 BCE onwards) can be seen in form of a mural painting done in cave number 9 at the world famous Buddhist rock cut temples at Ajantha in Maharashtra state of India. Here a King is shown listening to a troupe of ladies singing and playing musical instruments. According to experts, this mural was painted around the beginning of our era. Koutilya's famous book 'Arthashastra,' written even before this period, has some references to music. Sage Vatsayan (period unknown) describes Music as a total and unique assimilation of three aspects: Geetam or Vocal Music, Vadyam or percussion instruments music and finally Nrityam or dancing. From 7th century onwards, definite references are found about musicians performing in the courts of Kings and rulers. Singers like 'Tansen,' who sung at Emperor Akbar's court are well known. Unfortunately, in sprite of such wide patronage, vocal music in India remained an art that was passed down by a Guru to his disciples in a vocal form. There were no written text books or Chronicles at all, except for few possible exceptions like sarangdev’s “Sangeet Ratnakar“ (Sea of Music.) Further to add to the woes, after eighteenth century, when British slowly took over India, their rule saw a decline of the court sponsored Musicians. As a result, the musicians kept their knowledge and practice to themselves confining it within their own family members. Music became a vehicle of entertainment and was looked down upon in society. The only exception to this trend were the rulers of few states like Gwalior, Baroda and Ayodhya. The grim scene continued till late nineteenth century, when an Indian musicologist, Pandit Vishnu Narayan Bhatkhande (August 10, 1860 – September 19, 1936) made attempts to write the first ever modern treatise on Hindustani Classical Music. Vishnu Narayan Bhatkhande was born into a Chittapawan Brahmin family in Mumbai, and was educated at Elphinstone College in Mumbai and Deccan College in Pune. He graduated with a degree in Law in 1885 and joined the legal profession in 1887. During his college days, Bhatkhande began learning sitar playing. He later learned vocal music too. He also got himself trained in other aspects of classical music. After the death of his wife and his daughter, Bhatkhande abandoned his legal practice and decided to devote the rest of his life to systematizing the prevailing forms of Hindustani music and building on that system a coordinated theory and practice of music. Vishnu Narayan Bhatkhande came out with his first research paper titled as 'Swar Malika,' (Strings of Notes) as a booklet containing detailed descriptions of all prevalent 'Ragas.' In 1909, he published his works, Shri Mallakshaya Sangeetam, in Sanskrit. Later he published a commentary on his own book to make this cultural heritage accessible to the common man. This commentary, titled as ' Hindustani Sangeet Paddhati,' was published in four volumes. These volumes form today the standard text on Hindustani music, an indispensable starting point for any student. I have narrated this history of Indian classical music just to highlight the fact that like many other skills and arts of ancient or medieval India, Indian classical music on thresholds of extinction, was just saved from the oblivion by efforts of this one man. The main reason for this narrow escape was the basic tendency of Indian experts in almost all fields of knowledge, who were always reluctant to put down in writing in a systematic and scientific manner details of their expertise and skills; be it architecture, medicine or any other fields. Chinese have been well known about their immaculate preservation of historical documents written over last hundreds or thousands years. Being such an ancient civilization, which very well compares with Indian civilization, I had always taken for granted that Chinese must have kept written chronicles or text books for music. Surprisingly I never came across references anywhere about availability or even existence of any such ancient Chinese musical chronicles or text books. 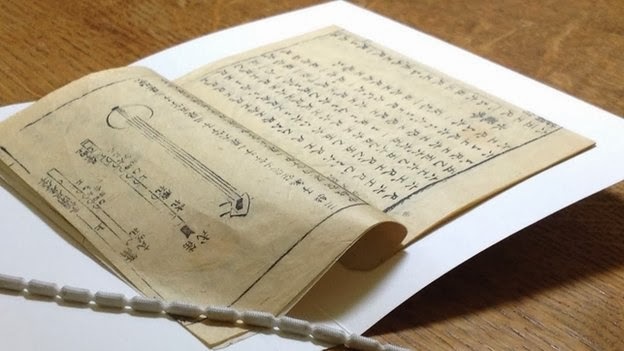 It has come to light only recently that a copy of a rare volume of an ancient Chinese text about pre-modern Chinese musical notation, exists and has survived for last two centuries in Cambridge, England. The book titled as 'Xian Di Pipa Pu' was brought to England by one Reverend James Inman from China. Unfortunately the merchant ship on which he was sailing had an encounter with a French naval squadron off the Malaysian coast in February 1804. Rev, Inman somehow survived to tell the tale and donate his collection of Chinese books to St John's College in Cambridge. This book, being one of them, has been now identified as a possibly unique collection of musical scores. The book contains an introduction to three Chinese instruments related to the lute, flute and recorder, followed by 13 pieces of music using the traditional musical notation known as Gongche. According to Professor Zhiwu Wu of the Xinghai Conservatory in Guangzhou, the book is a rare volume of pre-modern Chinese musical notation. Dr Jian Yang, a Chinese scholar says that the book's survival offered the chance to learn more about Chinese culture and music... after 210 years of silence.